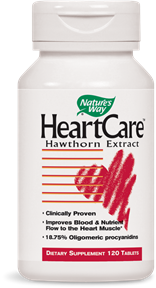 While many other hawthorn extracts contain vitexin from the plant’s berries, HeartCare is standardized to oligomeric procyanidins extracted from the leaves and flowers for optimal effectiveness. Take 1 tablet twice daily with water. For intensive use, take up to 2 tablets three times daily. Best results are obtained with continual use. If pregnant, nursing or taking any medications, consult a healthcare professional before use.